Dandi is a village in the Navsari District. It is located on the coast of the Arabian Sea . It shot into worldwide prominence in 1930 when Mahatma Gandhi selected it to be the destination for the Salt March. He marched from Sabarmati (Ahmedabad) to Dandi with some of his followers to protest against the imposition of a tax on salt. Thousands of people participated, travelling on foot for 24 days from Ahmedabad to Dandi.The Government of India initiated plans to develop the Sabarmati-Dandi stretch as a tourist hub. 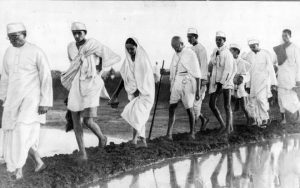 The government also proposed building a memorial to commemorate the Salt March of the Indian Independence Movement.